Part of the show How Do Jellyfish Reproduce? Meera - This week saw the start of the Cambridge Science Festival. So I've come along to one of the main event days which is Science on Saturday. I've kicked things off today by visiting the plant sciences department and with me to tell me more is Jim Haseloff from the plant sciences department here at the University of Cambridge. Jim - The theme of this year's science festival is diverse science, looking at diversity in development, diversity in physiology, diversity in properties of plants. Within the tent, we've got quite a range of activities and diverse plants, there's a supply of seed and flowers, synthetic biology and application to engineering of plants both now and the future. Essentially, thinking of how living systems work and how you might tweak or adjust them in the same way you might adjust a plant to produce more drug for drug production or to improve production for bio-energy or for food production for example. Meera - The point of the festival is to make things a bit hands-on and interactive. So, what are the key hands-on activities that you've got here today because I've seen children looking in microscopes and handling mushrooms..? Jim - They range from just the observation of biological systems or looking at fungi and plants and algae through to a giant flower that children can crawl into and that giant flower is full of nectar in the form of sweets, and they have pollen then full of glitter, and the kids dress up in bee suits and crawl into the flower and do the job a bee does essentially. Meera - Actually that's just behind us now I think and it's quite popular. Meera - So lots going on? Jim - Yeah, yes. It's all fun. Meera - So, I've stepped away from the plants now and I've decided to try and travel back in time by visiting the Time Truck activity here at the festival. With me is Gareth Fabrow who's a student at the Earth Sciences department here at Cambridge. Hello, Gareth. Meera - What are the main aims of the Time Truck here today? Gareth - Mainly, we want to bring out rocks and fossils which are normally kept in museums behind glass, and allow people to actually touch them and interact with them and get a closer look. We have bits of all types of earth science. We've got some fossils, some dinosaur pieces, we have some rocks, minerals, and we also have a volcano. But it's generally to think more about our planet, how it's put together, what it was like in the past, and how we can tell that, more importantly. Meera - So we're actually standing now by your favourite hands-on activity here today, and it's a very large dinosaur foot! Gareth - Yeah, well this is from an Albertosaurus which is like a T-Rex but a bit smaller. The foot is still about 2 feet long and has sharp claws on the end. I also have here a chicken's foot and if you can compare the two, they both have three toes and they both have the same amount of bones in their toes, and they have similar claws on the end. Obviously, the chicken's foot is a lot smaller. So from that, we can deduce that dinosaurs evolved into birds. Well with that and lots of other bits of evidence as well. Meera - I was just heading over to the pit building but on my way, I just stumbled across a Formula One car in the middle of a car park. So I'm now here with Gordon Day who works with the Williams F1 team. Gordon - Williams and Cambridge University press have done an educational software package for a primary school called Race to Learn and we're demonstrating one of the modules for Race to Learn here at the festival. We've brought a racing car as well so that we can show everyone coming through our racing car up close. Meera - So tell me a bit more about this Formula One car because it looks fantastic. 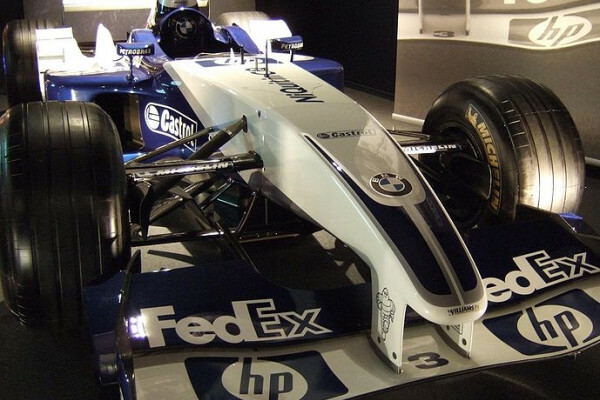 Gordon - This Formula One car is from 2003. It's an FW25 and it was raced by Juan Pablo Montoya and Ralph Schumacher. Meera - Wow! Tell me a bit of the actual stats of the car. Meera - Where the driver sits, it's just in front and there's lots of different coloured buttons. So these obviously control very crucial aspects of the car. Gordon - That's right. It looks a bit like the cockpit on a fighter plane with lots of controls for the driver and they control the various systems on the car, plus you can push a radio button to talk to the pit and there's even a drinks button that delivers a drink to him through his helmet. Meera - Very clever. So lots of technology involved here? Gordon - A lot of technology indeed. Meera - How would you say the visitors have been reacting to the car then? I mean, I'm just quite surprised to see it here. Thomas - Hello. My name is Thomas Abbott and I am standing next to a Formula One car. Meera - Have you learned anything about it that you maybe didn't know before. Is there anything that you learned about it that's quite surprising? Thomas - That their pit stops are around three seconds now. It's like it stopped then bzzz... and all the tires are off and they got a board underneath. So if it goes too low, then quite a lot of the board will be scraped, so they know they have to make it higher. Meera - Has this made you want to be a Formula One driver? Thomas - I've always wanted to be a Formula One driver. Meera - It's been a long day here at the festival and I have to admit, I'm very hungry. So I found out about a food factory that's going on at the Pitt building. From what I can see, there are children everywhere, making lots of bags of cereal. And here to tell me more about how they're making these is Holly Magerison who's from the Human Nutrition unit at the Medical Research Council here in Cambridge. Hello, (Hollie). Hollie:: Hi, there. We're basically trying to show children what actually goes into the food that they're eating. So, a lot of children will go into a supermarket, pick up a cereal box from the supermarket shelf, take it home and eat it, but not really know what's actually going into it. We're showing them the malt extract, the added salt and sugar for flavouring that goes into the cereal, we're also showing them the iron and the six different B vitamins that are going into their corn flakes. Not only that. We're also showing them that not all food processing is bad. And that making cornflakes takes quite a long time as they're finding today. The children are removing the bran and germ from the corn, they're adding different vitamins and minerals to the corn, they're drying them, they're rolling them out, they're toasting them and we've even got our own tasting panel so they can try different mix and brands of cornflakes to see which ones they prefer. Meera - I can hear a hair dryer going in the background and a lot of pounding. So I'm assuming the pounding is to combine it all together and the hair drying is another way of toasting them. Hollie - No. we're actually toasting them in the oven. The cooking and drying stage that they do in the industry, they do in huge steam dryers. Obviously, we're trying to bring it down to the Blue Peter level if you like. So we're using hair dryers, just to dry the corn off and then they use the rolling pins to roll out the corn, but as you can hear, the corn can be very tough to roll so they're banging the corn first and then giving it a roll to make it into a flake. Hollie - I think they're all very priced possessions. You might be hard pushed to get one yourself. Meera - Okay, well I can hope! What's your names? Meera - First of all Carl, what have you learned today about just what goes into your cereal? Carl - I've learned how they extract the vitamins then they put them back in, and I found that quite intriguing. Meera - And why did they extract it and just put them back again? Carl - They extract them because then it makes the cooking process much more easier. Meera - And how about you Robert? What have you learned about the cereal production process today? Robert - Well I learned there are lots of different makes of cereals, with different taste and different amount of vitamins in which was actually quite surprising because not all cornflakes tastes the same. Meera - So have you got your cereal with you now or you're waiting for it to be tasted? What stage are you at? Robert - I'm waiting for it to be baked at the moment. Meera - And what about you Carl? Carl - I'm also waiting for it to be baked. Meera - Can I tempt you to give me any of your cereal? I'm very hungry.